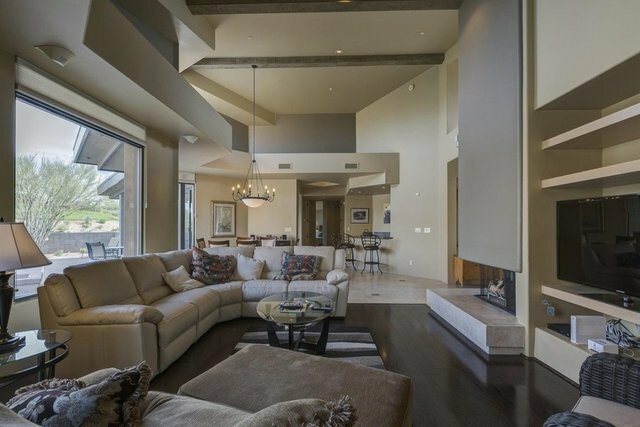 Located in the prestigious guard gated Desert Mountain Club in North Scottsdale, AZ. Light and bright open floor plan lending itself to great entertaining. New patio, pool & spa added in October 2015 The home has 3 bedrooms + separate guest casita with King beds in Master & Casita, 3rd bedroom w/queen & 4th bedroom with 2 full beds. Every bedroom has en-suite baths for complete privacy, walk-in closets, separate exit to patios, and in separate area of the home. NO Steps. Offer short term Monday B-4 Thanksgiving thru April $9000/Mo. ; May, Sept, Oct & Nov $7000/mo. June-Aug @ $5000/mo. Utility cap applies. ALSO, offered Long Term Rental min. 12 months @ $7000/mo + Utilities. Amenities are for Desert Mountain Members only.